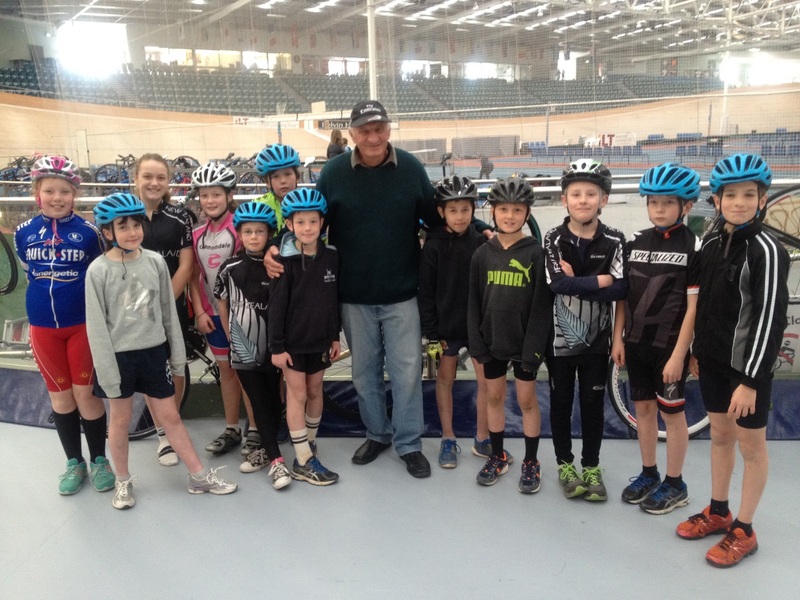 Our young members in the Cycling Southland Wheelers group had their picture taken alongside one of the legends of New Zealand cycling recently and even though they had no idea who he was, they were encouraged to mention the name Warwick Dalton to their grandparents next time they saw them – and watch for a reaction. Warwick was in Invercargill recently to attend a funeral and still speaks volumes of his times in Southland during his outstanding career. He was extremely impressed with seeing the young Wednesday Wheelers in action and pleased to see that the future of the sport in Southland was alive and well. Warwick Dalton became a household name in Southland during the late 1950’s and 60’s with his superb riding abilities on both track and road. Warwick’s Coach recommended to him that he come to Southland to train and race, because of the Kew Bowl facility and the type of racing that was offered in Southland. Regularly, the Kew Bowl facility in South Invercargill was packed with spectators who had come for one reason – to see the legendary Warwick Dalton compete against the best that New Zealand, Australia and other countries could offer – and win. It was not uncommon to have up to 3000 people lining the Kew Bowl track to watch the exciting action that he provided. Dalton, arguably New Zealand’s greatest all-round amateur cyclist, dominated cycling in New Zealand in the late 50’s and early 60s’ winning a wide range of events from the gruelling 1000m time trial event through to multi-stage road events such as the Dulux Tour of the North Island and the Tour of Southland, the latter an event that he won on three occasions, firstly in 1959 as a 22 year-old, again in 1961 and 1969. In his earlier career, Dalton crossed the globe and achieved remarkable results against the best amateur riders of Britain and Europe, including riding the Milk Race Tour of Britain which he won in 1961 and was prominently placed on many other occasions. In the prime of his career he switched to the professional ranks and despite being offered a contract in France, Dalton chose to base himself in Australia. During his illustrious career, Dalton represented New Zealand at the 1956 Melbourne Olympics, the 1958 Commonwealth Games in Cardiff, Wales (bronze medals in the 1km time trial and 4000m team pursuit) and the Rome Olympics in 1960. Dalton also won the Australian Road title in 1963. At the ripe young age of 71, the cycling legend rounded off an outstanding career by winning the UCI Masters World Champion Points Race in Sydney 2008. “It is an absolute pleasure to come back to Southland, a province that embraced me and assisted greatly with my career. I keep reminding my many cycling colleagues that Southland was responsible for the great things that are happening in our sport currently. They (Southland) got off their backsides and built New Zealand’s first indoor cycling facility – an amazing feat for a small but enthusiastic region.” Warwick Dalton.